It's been almost a year since my last mascot story — that one was in March 2009, after somebody punched McGruff the Crime Dog in the face — so I had been on the lookout for one. But I did not see this coming. Neither did John Coomer, who alleges he was hit in the eye with a hot dog thrown by the Kansas City Royals' mascot, Sluggerrr, on September 8 of last year. Coomer sued the Royals in Jackson County, Missouri, earlier this month. Though I am originally from Kansas City, I am not a baseball fan, so I was not familiar with Sluggerrr until now. (The Royals have had one winning season since he joined the team in 1996, so not that many other people have seen him, either.) But I am going to take a stab here and guess that Sluggerrr's name is spelled with three Rs because he is a lion, and the lion makes sense as a Royals mascot because a lion is "king of the jungle," and those extremely disturbing things rising out of Sluggerrr's head are meant to form a kind of freakish, mutated crown. Anyway, according to the lawsuit, Coomer was injured while Sluggerrr was attempting to entertain fans during a break in the action (if "action" is the right word to use for a Royals game these days). I have seen other mascots resort to artificial means to excite a crowd, such as blasting rolled-up T-shirts high into the stands with an air cannon. Whether or not Sluggerrr ever fires T-shirts, I don't know, but on this occasion he was launching hot dogs. Plaintiff was seated approximately six rows up from the third base dugout. . . . During a break in the game, Slugger climbed atop the third base dugout and started shooting hotdogs into the stands from an air gun. After he finished with the air gun, Slugger started throwing hot dogs into the stands. While doing so, Slugger attempted to throw a hotdog into the stands with a throw behind his back. Instead of throwing the hotdog at an arch high into the stands, Slugger lost control of his throw, or was reckless with his throw, and threw the hotdog directly into plaintiff, who was sitting a few feet away. The hotdog struck Plaintiff in his left eye. Coomer v. Kansas City Royals Baseball Corp., No. 1016-CV04073, Compl. at 10-11 (filed Feb. 8, 2010) (mistakes as to "Slugger" and "hotdogs" in original). Coomer alleges that the mascot-flung sausage caused serious injuries to his left eye and that he has had to undergo surgery. Sluggerrr is not named in the lawsuit, but Coomer alleges the team is liable because the pseudo-lion was acting in the course and scope of his employment at the time of the battery. Now, there is nothing funny about a detached retina, which Coomer allegedly suffered. 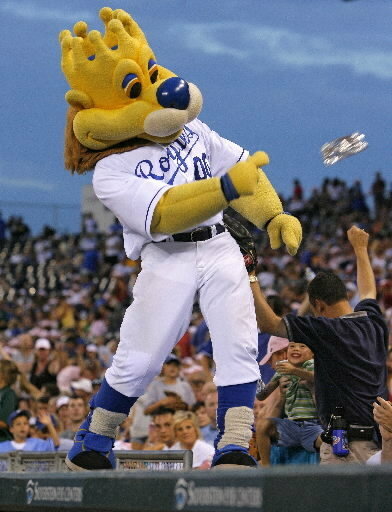 But these allegations have not yet been tested, and the first test I would like to see is for the Royals to use a radar gun to see how fast a hot dog can actually be thrown by a guy in a lion suit who plaintiff concedes was throwing behind his back. Also, I was not aware of this hot-dog-tossing trend, but surely the dogs are provided with some kind of cushioning if only so they can survive being fired out of a cannon. If so, that seems to make an eye injury even less likely, even if plaintiff was sitting just six rows away as he claims. Setting the factual issues aside for the moment, the legal defense that comes to mind is "assumption of the risk." There is little question that if Coomer had been hit by a foul ball, he would have no claim because foul balls are part of the game of baseball and a spectator assumes the risk of being hit by one. Assumption of the risk most clearly applies to sporting events, but there is still a duty not to make the event more dangerous than it would otherwise be. That means there could still be negligence liability given that the alleged risk here was posed not by the sport itself but by a bratwurst-launching maniac in a lion outfit. But time will tell.